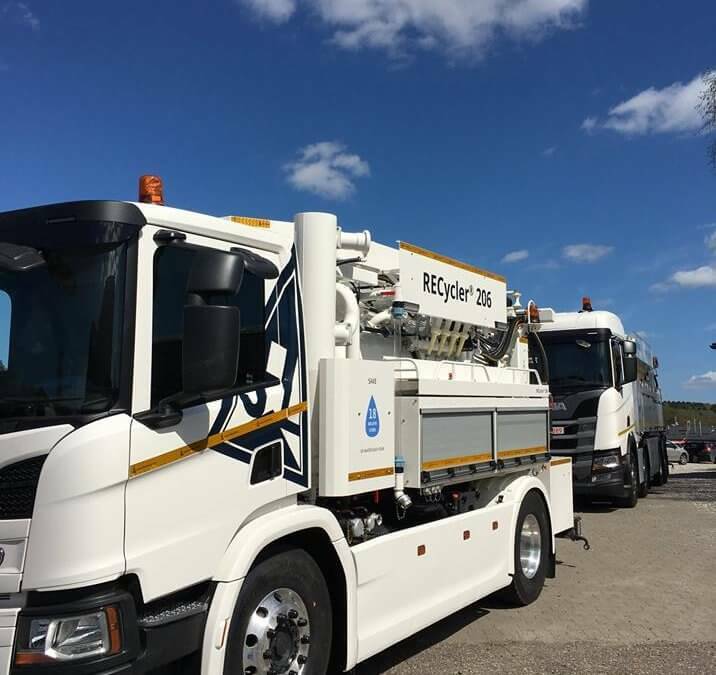 Recycler 206 JET VAC joins Midlands drainage fleet. We’re pretty pleased to announce that this brand new JHL Recycler 206 JET VAC is joining our drainage services fleet. Recycling water on site is proving cost effective and efficient for our clients throughout the Midlands and works in conjunction with our environmental policy on reducing our water consumption as a company. This new drainage vehicle now joins our ever expanding fleet with also includes 312 Recycler Jet Vacs and 416 Recycler Jet Vacs, along with our fleet of CCTV drain survey vans and bespoke Direction Water Cutter unit which make small work of sewer blockages caused by grout, root mass and encrustations, steel pile foundations and concrete cutting jobs. While initial set up costs may seem a little higher than hiring a standard Jet Vac unit, the benefits while on site far out way the costs. Effectively a Recycler Jet Vac does the same job as a standard Jet Vac used for drain jetting, but they have a clever in-built system that recycles the jetters water. Ultimately this means it’s more productive on site as it doesn’t have to keep refilling its tank or use valuable ‘work time’ to travel and refill its tank from a water hydrant potentially 5, 10 or 20 miles way, depending on the jobs location. Environmentally they use less fuel and draw less of our valuable water resources from water hydrants as they recycle their own jetting water and then separate the silt in their tanks. At Wilkinson Environmental we pride ourselves on delivering cost-effective sewer cleansing services and CCTV drainage surveys. We are also able to carry all drainage remedial works from our head quarters in Atherstone, Warwickshire and can offer drain repair services including drain lining, new sewer connections and drain adoption surveys throughout Warwick, Leicester, Coventry, Rugby, Birmingham, Wolverhampton, Northampton, Tamworth, Derby, Nottingham, Worcester, Gloucester, Oxford, Reading and London. All of are works come with a no obligation, free of charge quotation.